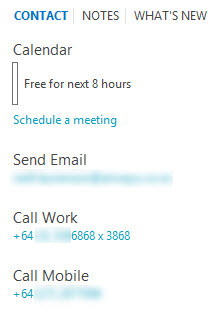 Perhaps one of the most mysterious of components in Lync is the Address Book Service and how it populates the Outlook contacts with numbers from AD and so on. Had one such interesting issue today and hadn’t realised the (now obvious) symptoms. What I do see is the mobile number. Checking the users AD Properties to see what’s been defined for the user in question I confirm that a valid number is indeed specified. Next I need to be sure that the number is being normalized by the AddressBook Service when updating the Lync Address Book. where +64 (1) 234 5678 x 4675 is the format we saw earlier in AD Properties. So far so good. The number is in AD, it is in a valid format so it should be in the contact card. Checking the contact card we find that it is indeed there under Call Work. Clicking on the hyperlink for Call Work reveals that the number cannot be called, this eludes to the true reason why the number does not show up under the Call button. To call the number as it shows up in the contact card a Lync Dial Plan entry has to be added that normalises the number to its Lync format (so it normalises back to the Lync users Line URI). You can use the same pattern as was seen in the ABServer.exe match. Once the normalisation rule has been added you should be able to call the number in the contact card by clicking on the hyperlink for Call Work. Once the number has a matching Dial Plan rule it appears as an entry in the selection list of the Call Button. If you wish to see a number in the Call Button selection list then a matching Dial Plan rule to call the number must exist. Obvious now that we know.